For many years, meals in Australia were based on traditional British cuisine introduced to the country by settlers from the United Kingdom. Commonly such meals were based around roasted or grilled meat, or pies, and accompanied by vegetables. Today, British traditions do persist, especially in the takeaway food sector, but a variety of new dishes have also been introduced. These include dishes inspired by Mediterranean and Asian recipes (in large part due to increased immigration from these countries), "Bush tucker" (foraged food, often based on aboriginal traditional foods), and new recipes based around uniquely Australian plants. Vegemite - A salty paste based on yeast extract and served in sandwiches or on toast. Chiko roll - A deep-fried snack inspired by Chinese spring rolls. Chiko rolls contain a spiced mixture of mutton, barley, cabbage, carrots, and celery. Damper - A wheat-based soda bread traditionally made by outback travellers. Pie floater - A meat pie, covered with tomato sauce, and placed (usually upside-down) in thick green pea soup. ANZAC biscuit (New Zealand also claims to the be the origin of this recipe) - Biscuits made from rolled oats, coconut and syrup. Pavlova (New Zealand also claims to the be the origin of this recipe) - A dessert meringue. It has a crispy exterior, but is light and fluffy inside. 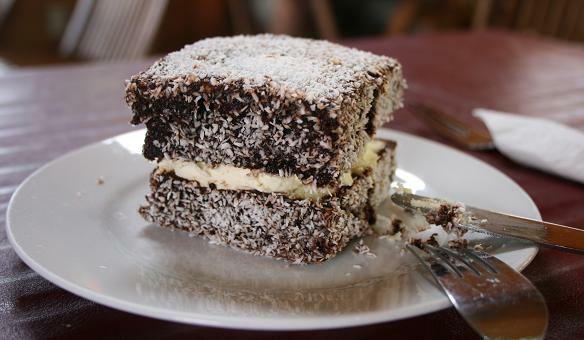 Lamingtons - Sponge cake, cubed, and topped with chocolate icing and dessicated coconut. Sometimes they are cut into two halves, and a layer of cream or strawberry jam is placed between the halves. Violet Crumble - A chocolate bar containing a honeycomb-like center. Jaffas - An orange-flavored candy containing a soft chocolate center. Tim Tam - A malted chocolate biscuit with a cream-like filling. The author, a dual citizen of the U.S. and Australia, brings his love of well prepared food and creative recipes to present a unique survey of the current food scenes in both countries. He is a native of San Antonio, Texas, where Tex-Mex is king and he provides recipes for that tradition,as well. 365 pages and a color photograph of nearly each dish makes an enjoyable reading experience. He provides anecdotes throughout. His recipes are geared towards cooking for 2. Many people live alone and will enjoy the comfort of using a book specifically written for them.